Over the past 5 years of racing ultras, I've had this distinct concept of myself as a young, aggressive, "go out hard, fade to the finish" runner based on how most of my races have turned out. I'm usually too busy pushing the pace to take in many calories, and usually wing the last few miles of a race. Yet, on Saturday, I did the exact opposite (kind of on accident). 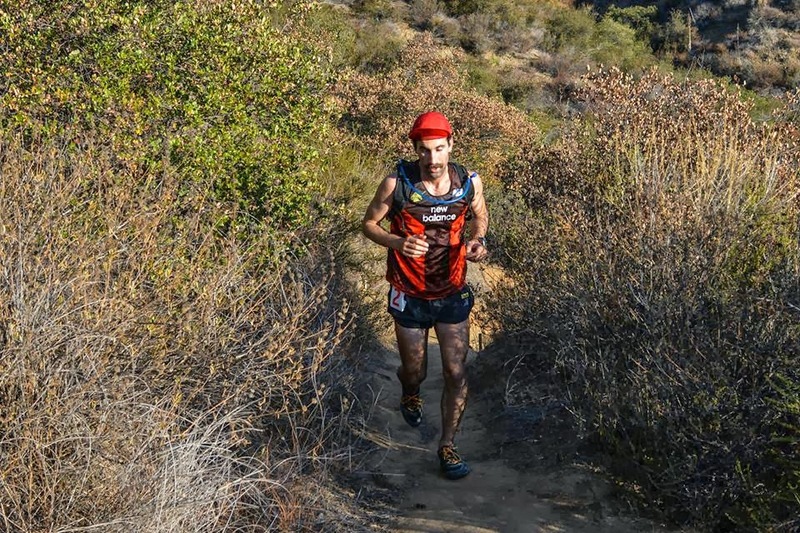 Jon Clark is 39 years old, but he runs shorter trails with the speed of a 20 year old. 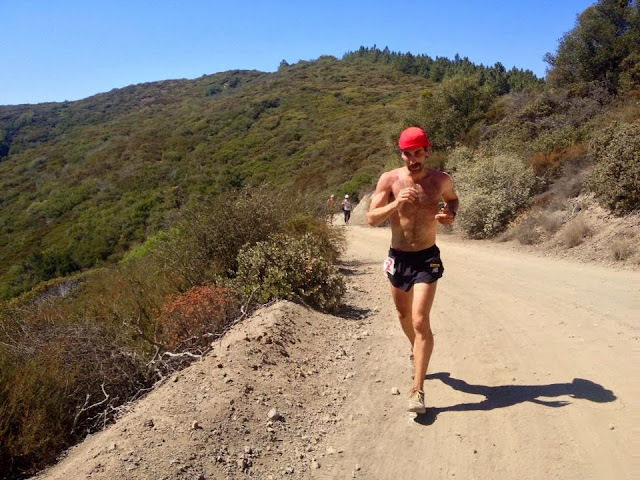 I describe it as my tempo pace on roads while going up and down technical trails. 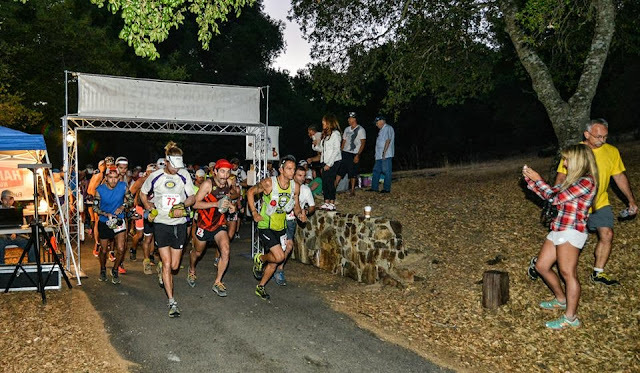 The first 12 miles went by quickly, with Jon running just under 7 minute pace on the technical and rolling San Juan trail while I bridged the gap between him and the chase pack. 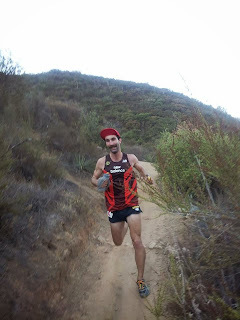 Going into the race, he looked like the favorite to dominate his home trails, so I kept him within a minute to stay in the race even though it felt a bit fast for my legs that had been in idyllic vacation mode. I dropped my handheld at Lazy Jay and picked up my camlebak that I had pre-mixed with a blend of gels and a scoop of PowerBar recovery. I had planned on having it mixed slightly concentrated for the bottom part of the Los Pinos climb and diluting it at the halfway aid station to "nail my nutrition". Unfortunately, at 7:30 AM, the bottom half of Los Pinos was way hotter, humid-er, and more exposed than I expected. The dew on the hillside was turning to steam, the thermoclines were in full effect pulling all the warm air up the ridge, and the sun was brighter than Einstein, making for a little slice of hell as the peloton caught up to me and began to pass me one by one. The heat and hard climbing made me thirsty, but the more I drank, the more calories I stuffed in myself making me feel hot, bloated and dehydrated (super deluxe combo). Eventually the rest of the field settled into a hike and I stopped losing time for a bit. I sipped small gulps of sugary-protein water and paused wondering if I should call it a day at the top. I was breathing hard, getting nauseous, and dehydrating myself with every small climb. 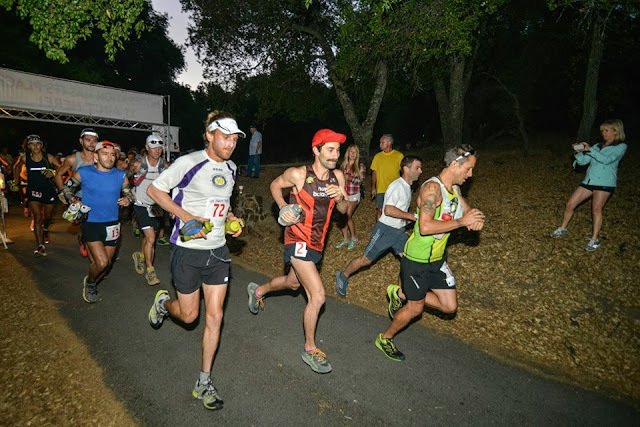 When the Black Hole aid station finally came into view, I grunted up the hill and stopped there for a few minutes trying to dilute my stomach and bladder with cool, clean water. Eventually I felt like I'd rehydrated enough to continue and I jogged out of the aid station in the back of the stretched out peloton. taking apart the climb. Since I didn't (as stated) ever finish fast in races, I thought I'd call it day at the Trabucco aid station at mile 20. I had no good memories of the rocky and clumsy Trabucco Trail, and I didn't think a hot climb up Horsetheif would do anything but reinforce that I was in fact, sucking today. Unbeknownst to me, almost everyone else in the field was slowing down and struggling. I reeled James back in a few minutes and felt encouraged as I looked across the ridge and saw Fabrice walking a hill that I planned to run. Another few minutes later I was yelling "Bonjour!" as I slipped by into 5th. The top of Los Pinos is where there actually are a handful of pine trees, and I enjoyed the feeling of accomplishment enough to think I might catch Michele. I came into the aid station and called out exactly what I wanted, ice in my pack, a couple gels in the water, and a gel for my shorts. I doused in water and took off down the Trabucco Trail after Michele who had just left. My feet fell wherever they could feel stable on the trail, and I moved un-athletically down the trail. I snuck up on Michele and picked up a little bit of speed as I got in a rhythm. I counted I was in 4th and tried to visualize the next three guys crawling up Horsetheif. I didn't know how far behind I was, but I knew if I ran as much of the climb as I could, I would certainly catch one or two more people. I counted down from 30 a few times, refusing to let myself walk until the arbitrary number 0 had been reached or I made it into some shade. The mind tricks worked and I caught up to Jon Clark hiking through a low. I may have made a comment about how hot it was, and how we should just take off our clothes, but that could be blamed on the heat baking my head.. When I reached the top, Dan told me I was 2nd and was nine minutes back of Brian. Leaving Trabuco 2, mi 29. Photo: Panda. The Main Divide is basically the "Lame Divide" that I've become well acquainted with on the Old Goats 50 mile course. After the adrenaline rush of technical, narrow, harrowing singletrack, the Main Divide fireroad is open, barren, exposed, un-inspiring. The brim of my cap went down and I grunted along checking over my shoulder for a reincarnated Jon Clark. I made good time reeling in Brian by another couple minutes, but the last split of 7 minutes for a mere 2.3 miles meant second was as good as it would get. 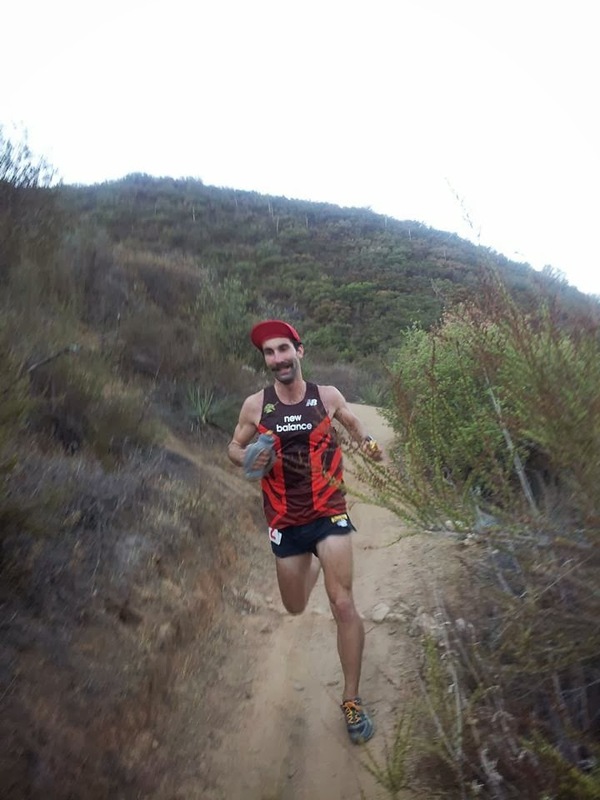 I cruised down the last few miles of fireroad and enjoyed the last stretch of singletrack on the Falcon Trail into the finish line for a finishing time of 5:06, bettering my time by 12 minutes (or 22 minutes, Jon Clark believes the course was 10 minutes longer). Small band with big heart, saw them at the Notch. We danced hard. As far as training goes, I'm right around 50 miles a week, but still feel kinda fit. I'll probably do a few more miles as AC seems to have washed over by now. Nice job! What shoes did you wear?